A section of the Arctic Ocean seafloor that holds vast stores of frozen methane is showing signs of instability and widespread venting of the powerful greenhouse gas, according to the findings of an international research team led by University of Alaska Fairbanks scientists Natalia Shakhova and Igor Semiletov. The research results, published in the March 5 edition of the journal Science, show that the permafrost under the East Siberian Arctic Shelf, long thought to be an impermeable barrier sealing in methane, is perforated and is leaking large amounts of methane into the atmosphere. 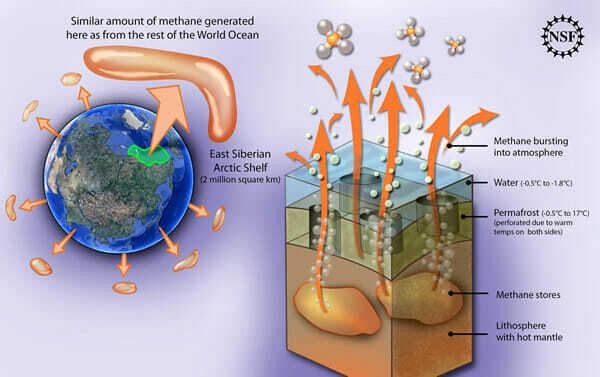 Release of even a fraction of the methane stored in the shelf could trigger abrupt climate warming. British and German scientists have discovered 250 plumes of methane gas rising from the thawing seabed off the Spitsbergen archipelago in the Norwegian Arctic, apparently a result of the warming of the West Spitsbergen current. How important are these fluxes in the global methane cycle? Considering the global emissions of ~440 Tg C as methane per year, the Siberian Arctic Ocean emissions and the changes in northern wetland emissions are negligible. This is good news, implying that current climate change does not affect the natural methane cycle in a globally important way. But will this persist into the future under sustained warming trends? We do not know. given the uncertainty associated with the release of methane from the sea floor, at least we can hope that we’re no worse off than we already knew. Hardly comforting. Clearly there is a rather urgent need to better understand the methane cycle. Their conclusion is reassuring (hey I thought the people at Real Climate were supposed to be alarmist! ), and that makes me think that the tone of my post (particularly the line ‘definitely worrisome, if not yet catastrophic’) is too dramatic in tone, though not actually inaccurate. And for that I want to apologize. What I like about the handling of this matter is how climatologists are being very conservative in commenting on scope, cause and likely effects. They’re neither underplaying it nor are they leading with their chins. That’s a great approach. I mean that is just plain irresponsible… oh wait! On a more serious note, I do think I erred with the tone of this post, although I don’t think what I said was actually wrong. An update is coming. I’ve had the privilege of talking to Archer about clathrates in the past. Consequently I did not jump on this particular bandwagon. You are in good company, as Lou Grinzo and Joe Romm did too. But you have the class to backpedal. Just because there is terrible denialism doesn’t mean get all doom and gloom about every publication that gets some press is the right response. The clathrate story is really interesting because there is a good chance it will come back to bite the world in a couple of thousand years as the warming signal propagates down through the ocean. The ethics of that are troubling. But heat propagation in mud is very slow. This particular deposit would probably not be an abrupt change mechanism. But you have the class to backpedal. Clearly you are not in politics:) Thank you!